You can’t really follow any workout routine if you don’t have at least one set of Olympic weights. So it is definitely a must-have for any home gym setup, no matter how small it is. At a first glance, all plates look more or less the same, right? Well yeah, but there are some key features that will make a ton of difference in the way you use and interact with your plates in your everyday workouts. 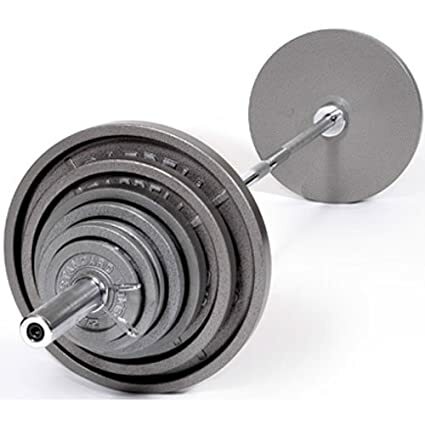 In this post, we will be explaining what are the things you need to look for before buying an Olympic weight set. We are going to review the top 5 best Olympic weight sets of 2017 and lastly but not least we are going to pick our favorite. 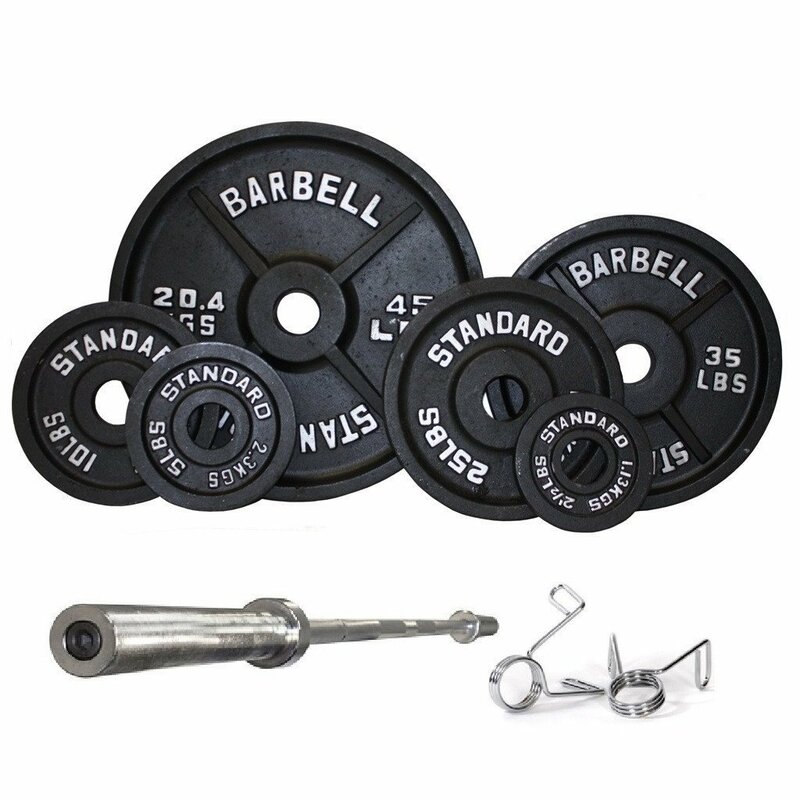 The Body Solid weights are available in 3 different sets: 255 lbs., 355 lbs. and 455 lbs. 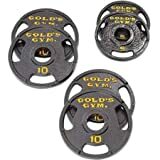 Each of these sets will contain at least a pair any plate size you will need from 2.5 lbs. up to 45 lbs. The approximate diameter of the 45 lbs. plates is 18 inches. 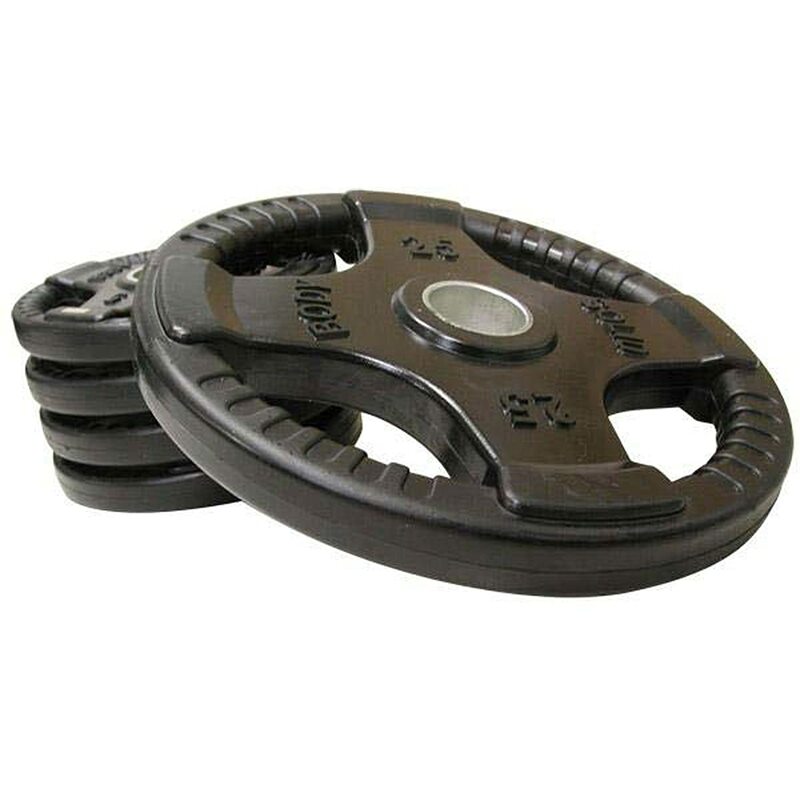 The plates are covered with a rubber-like material which offers good grip and will prevent any rusting as well as damage either the weights or your home gym floors and walls. The Body Solid Olympic weight set features a metal inner sleeve which will let them fit smoothly and effortlessly on the bar. The design of the plates looks nice and each plate has 4 openings which will allow for super-easy handling and a solid grip. It is super easy to hold them so you can easily use them for various exercises such as weighted step-ups if you don’t want to use dumbbells. On the downside, after you buy these you will need to wash and scrub them in order to get rid of the smell and oily stuff they are covered in. Otherwise, they will stain whatever you touch with them. With the USA Sports, you get a set of 300 lbs. which includes a 7 feet Olympic bar and a pair of spring collars. The set includes 14 plates in total: Two 2.5 lbs., Four 5 lbs., Two 10 lbs., Two 25 lbs., Two 35 lbs. and Two 45 lbs. There’s no rubber casing, instead, you will find a grey enamel finish on these plate set which looks really good. The inner sleeve is nicely finished and it will allow for easy load and unload to and from the bar. The downside we see is that there are no openings to allow for an easier handle of the plates. The rounded edges are comfortable to use when carrying the weights around, but can’t beat a quad-grip or tri-grip design. The finish is quite smooth and if you combine that with sweaty hands you might have a problem. Additionally, you can’t really perform any exercises while holding these plates. Also, since there’s no rubber coating, it is likely to see them collecting some rust here and there after a while. These come in a wide range of sets, starting from 50 lbs. up to 250 lbs., with 10 or 20 lbs. increments. So you can get pretty much any plates combination you want. The plates have a nice metallic finish to them with nice yellow letters and numbers to help you figure out which one is which really quickly. The overall design looks really good, they have round edges and everything feels smooth. They also have 3 openings which will allow for easier handling with either two hands or just one hand. You can easily use them for free-weight exercises such as flyes or shoulder shrugs, instead of using dumbbells, if you want. There’s no smell or dirt on these when you receive them so no need to clean them yourself. Just get right to working out. Several users have reported some packaging/shipping issues, meaning that they received a different plate combination from what they ordered. That is pretty much the only downside we could find. 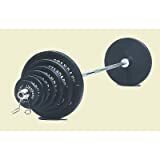 The Serious Steel Fitness Olympic weight set includes 2 x 45 lbs. plates, 2 x 35 lbs. plates, 2 x 25 lbs. plates, 2 x 10 lbs. plates, 4 x 5 lbs. plates and 2 x 2.5 lbs. plates. Additionally, you get a 7′ Olympic bar as well as a pair of spring collars. If you did the math, you may have noticed that the plates add up to just 255 lbs., not 300 lbs. as advertised in the title. The remaining 45 lbs. will be the weight of the 7’ bar. We find that to be a little bit misleading, so make sure to take this into consideration. You have the option to pick from 3 different designs: black, gray and gray VTX. They look very much like the USA Sports weight set. If you go with the black or gray be aware that there are no openings so you need to hold the plates from the edges when you carry them around. That’s a bit of an inconvenience. As we already mentioned, if you got sweaty hands the plates can become slippery and you can drop them off. 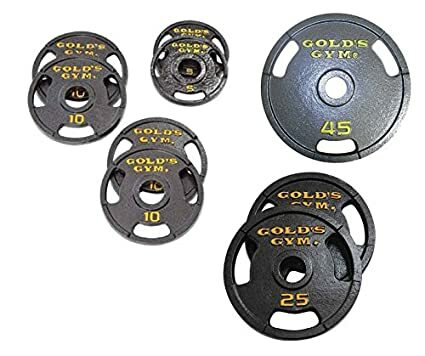 The gray VTX option comes with 3 openings though, very similar to the Gold’s Gym Olympic Plate Set design which will make your life so much more easier. With the XMark you get plenty of different weight sets combination to choose from. They start from 90 lbs. and go up to 355 lbs. in 5, 10, 20 or 50 increments. So you can really get the exact plates combination you need. 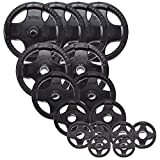 They are coated with a rubber-like material which will keep them from collecting rust and from making any noise when you smash them together. The grip is really good as well. Additionally, they have a 3 grip opening which works great. The downside of the rubber coating is that it is oily and smells pretty bad. You will need to scrub and wash them at least 1-2 times before you get rid of the smell and the oily stuff. Another thing we’ve noticed is that the rubber coating is quite thick and if you put the plates next to each other they don’t really “nest” that well. Other than that this weight set does its job really good. The metal inner sleeve will let them slide on and off the bar easily. 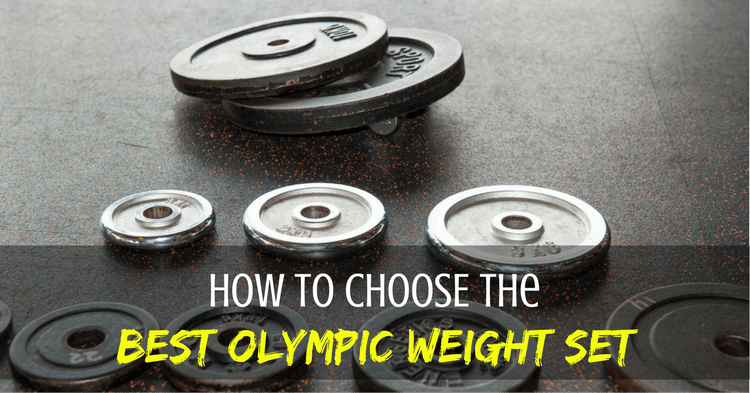 Here are the top aspects you want to consider before buying your Olympic weight set. The most important thing you want to figure out is how much weight you need and in what plate combination. Most of the times the weight sets will contain at least a pair of all plate sizes, but maybe that’s not always the best option for you. 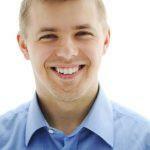 If you are just starting out, you will probably be fine with a standard 255 lbs. set. 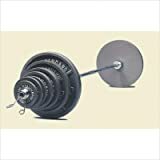 But if you are an intermediate or advanced lifter, you will most likely need at least 2 or ever 3 pairs of those 45 lbs. plates for your deadlifts, squats or bench press. It’s inconvenient and time consuming to load up the bar with 8 plates of all sizes just to get to 225 lbs. You will have 2 major options here: rubber coated or metal / no coating. Rubber coated plates will be less noisy, will allow a better grip and they will not collect any rust over time. The downside is that they have this funny smell when they are brand new and they can be oily. So you will most likely need to wash and scrub each plate right before you start using them. Rubber coated plates are bulkier as well, so they will take up more space and they will not fit next to each other that well. Plates with no coating, on the other hand, will be noisier and they will eventually start to collect some rust. They also tend to be more slippery, especially if there are no openings to allow you to hold them better. On the plus side, they are less bulky and they will “nest” together better. There are a couple of options available here too. First, you have the plates that don’t have any openings and you need to hold them by the sides when you carry them around or when you load/unload the bar. Obviously, these are a bit more difficult to handle. Then, there are plates which have 2, 3 or even 4 openings. These are easier to handle and you can hold them pretty easily while doing other exercises such as walking lunges or step-ups and so on. Lastly, you want to check out if the vendor offers a package deal. Sometimes a weight set might come with a 7’ Olympic bar and a pair of spring collars included. Be careful though. Most of the times the weight of the Olympic bar (45 lbs.) will be subtracted from the weight of the plate set. So with a 300 lbs. package, you will most likely get just 255 lbs. worth of plates. There’s no doubt that a weight set is a must addition to any home gym setup. You will be using your plates on a daily basis, so you want to make sure you get the ones which you like best. So it’s extremely important to make the decision based on your personal needs. Figure out how much weight do you need, what combination of plates is more convenient for you, what kind of grip and design you prefer. Ask yourself all those questions before shopping. 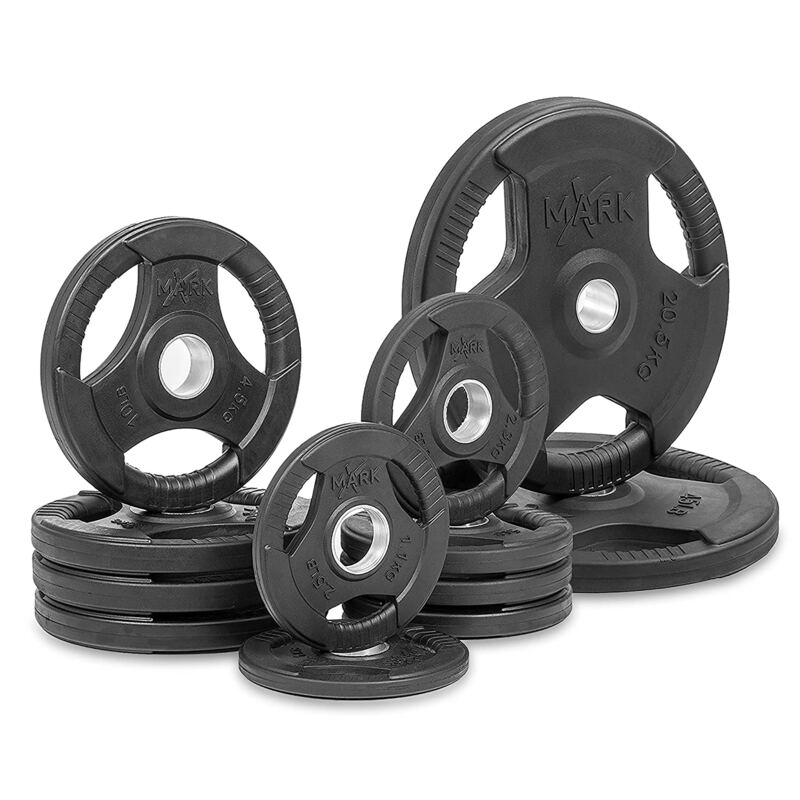 If you still can’t make out your mind and you need a tip, our pick for the best Olympic weight set would be the XMark Premium Quality Rubber Coated Tri-grip Olympic Weight Set. 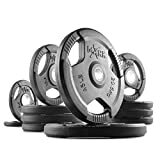 You can select the right plates combination from a variety of different weight sets and you can use them for free-weight exercises as well.